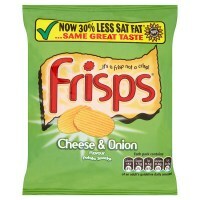 These are fairly standard flavour colour coded Crisps bags; although they say they are Frisps, not Crisps. The banner across the middle with the main logo, is all wrong - the font is wrong, the thickness of the font is wrong. It's just all wrong. It looks like a small child has drawn it. We would however like to offer some constructive criticism, and the bold colours are very striking. As far as reconstituted potato products go, these were perhaps as crunchy as any. The first couple of bites were meaty, even hearty, but the crunch deteriorated at variable rates, with parts of the Frisp turning mushy more quickly than others. As the pack says, "it's a Frisp not a crisp". This means it is a reconstituted product - that could not look much less like a Potato Crisp. All three of the Frisps varieties looked the same. They were pale yellow, almost white in colour. The undulations were not machine cut Ridges, but instead moulded rumbles. They featured powdery surfaces, but no visible oil. A Nose Plunge Test suggested the very slightest Cheese smell, but it was not significant. The taste was a little more rewarding. It was a sort of warming, potatoey flavour with a hint of Cheese and a very very tiny undercurrent of onion. They were also, oddly, sweet.